Anthony is the Broker/Owner and CEO of Lamacchia Realty, Lamacchia Property Management, and REAL Training and Systems Inc. Currently, Anthony spends his time running the companies, training agents, and strategically planning for the future. 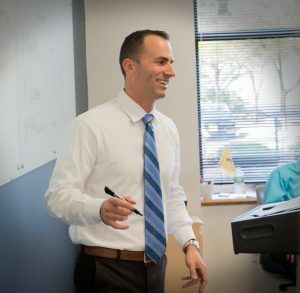 He is completely obsessed and passionate about providing all the agents and employees in the company with top-notch technology, the best possible tools, and the absolute very best training to excel in their careers and grow their businesses. In 2012, Lamacchia Realty launched REAL Training, a program for agents that provides ground-level training conducted by expert industry professionals with proven track records. With the ever-evolving real estate industry at hand, REAL Trainings are consistently updated with tactics and strategies that are applicable to the current market trends. This program is unparalleled on a national level and has increased the success of company agents on an exponential level. In 2015 Lamacchia started REAL Training and Systems Inc. which provides training to agents inside Lamacchia Realty and outside of Lamacchia Nationally. Anthony regularly trains Lamacchia Realty agents as well as national REAL Training clients all over the United States. Anthony’s trainings cover every aspect of real estate, from marketing to gaining referral business, converting buyer and seller leads, as well as navigating bidding wars and price adjustment dialogues with sellers. He speaks nationally at industry wide conventions, including NAR Boston, Inman Connect, Inman Indie Broker Summit, and the Zillow Premier Agent Forum. In 2018, Anthony was nominated for Inman’s Most Innovative Broker-Owner due to the REAL Training Program and growing online platform of how-to videos for real estate agents. Want Anthony to Come to You? Anthony travels all over to speak at events, conferences, trainings and more. Watch a quick 2 minute sample of his training in Virginia. If you would like to book him fill out the form below.